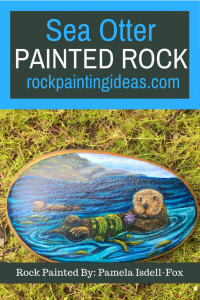 The Painted Rock Sea Otter Giveaway for July 2018 is here. To win this beautiful rock painted by Pamela Isdell-Fox, all you have to do is become a subscriber to the Rock Painting Ideas newsletter and live in the United States or Canada. “Sea Otter” will be given away on August 1st, 2018. Every month from now on, all eligible subscribers will be entered to win the rock of the month. One winner will receive this gorgeous rock. This rock has been sitting on my desk for a few weeks now, and let me tell you how hard it is to give this cutie-pie away! Look at all the details on this rock: the variety of colors of blue, the seaweed, and that adorable face… Whoever wins this rock will be one lucky duck! Make sure you join our Facebook group Rock Painting Ideas and Resources. It has over 22,000 rock painting enthusiasts just like you sharing ideas on what to paint and the best ideas out there. It offers daily inspiration, tips and techniques. Plus, you wouldn’t want to miss out on all the fun! You can join this group here. I came across Pamela Isdell-Fox on a fun art auction site on Facebook called Original Art Bid or Buy. I was looking for rocks to purchase to do the monthly giveaway. I couldn’t take my eyes off of this guy. It had a Buy-It-Now and I couldn’t purchase it fast enough. Pamela will be featured in a future post in our Rock Painting Interview Series. Pamela created this rock using acrylics and standard paintbrushes. She did it freehand. You can look at all her beautiful rocks on her Facebook Page called Fox Rocks and Fine Art. Getting started on rock painting is easy. You need to start with a few necessary supplies, and then you can create your works of art. 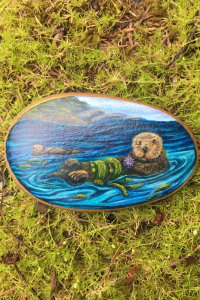 We’ve reached the end of Painted Rock Sea Otter Giveaway! Don’t forget to subscribe to our newsletter to be eligible to win our monthly rock giveaway. Make sure you pin the post below so you can refer back to it again and again. Great page! Right to the point.,.great products.. I love the sea otter rock. I have a wall dedicated to sea otter art! My little one just had an otter at his birthday! I’d love to put this rock next to party pictures as a keepsake! Beautiful Sea Otter. The detail is amazing!!! So informal. Great info. Beautiful rock. Thank you for the chance at a win as well. 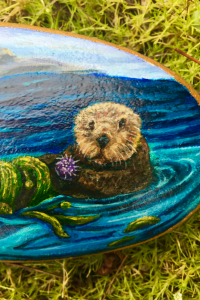 The Sea Otter reminds me of my Mom who passed in 2014 of Cancer,Sea Otters were her favorite..You didba great job on painting this rock..Goodluck to everyone..
My teenage son adores otters! Would love to be able to surprise him with this rock!